He denies the allegations, saying they are a "homophobic slur" against him. But Glaad said it would not honour his latest film, saying "survivors of sexual assault should be put first". British director Dexter Fletcher was brought in to complete the project, but in accordance with Director's Guild rules, Singer's name remained on the film's credits. Glaad said in a statement: "This week's story in The Atlantic documenting unspeakable harms endured by young men and teenage boys brought to light a reality that cannot be ignored or even tacitly rewarded. "Singer's response to The Atlantic story wrongfully used 'homophobia' to deflect from sexual assault allegations and Glaad urges the media and the industry at large to not gloss over the fact that survivors of sexual assault should be put first." 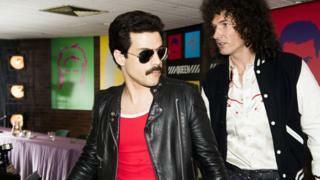 It described the decision to remove Bohemian Rhapsody as a "difficult" one, adding: "The legacy of Freddy Mercury deserves so much more than to be tainted in this way". "The over $800m Bohemian Rhapsody has grossed... is testament to his remarkable vision and acumen," said Millennium Films' boss Avi Lerner told The Hollywood Reporter. "I know the difference between agenda-driven fake news and reality, and I am very comfortable with this decision. In America people are innocent until proven otherwise."